I worked on two separate projects with Jim Comstock, West Virginia’s most famous newspaper editor, in 1994-1995. Here’s a little excerpt from The West Virginia Hillbilly (11 May 1995). My great-great-grandmother, Susan (Thompson) Kirk, recorded many family dates in her Bible. Her parents were Patton and Delana (Tomblin) Thompson. I descend from her son, Pat Kirk. Mom and I recently marked the grave of Andrew Elkins, our ancestor who served in Company D, 34th Battalion Virginia Cavalry. After the war, Andrew, the son of Marvel and Rhoda (Vance) Elkins, was a Baptist preacher and postmaster at Fourteen in Lincoln County, WV. The following list of Logan County marriages for the period of 1877 to 1878 reveals the names of preachers operating in the Harts Creek area. This is a “working list” and will be updated. The source for this material is “Marriages-Births-Deaths, 1872-1892,” pages 33-36, which is located at the Logan County Clerk’s Office in Logan, WV. Many thanks to the county clerks and their employees who have always been so helpful to my research these past twenty-five years. NOTE: Marriage records for the Lincoln County section of the community are unavailable. Son of Thomas M. and Barbara (McCaulley) Wilson, was born Oct. 15, 1842, in Pike county, Ky. His father was born March 6, 1820, in Botetourt county, Va., and died June 20, 1840. His mother was born in Pike county, Ky., and is now the wife of Simon Justice. S.M. Wilson, subject of this sketch, was married Oct. 5, 1865, to Nancy, daughter of Jesse and Margaret (Godfrey) Davis, both natives of Giles county, Va., and both now deceased. Mrs. Wilson was born Aug. 26, 1846, in Mercer county, W.Va., and they were married in Wyoming county. The offspring of this union has been: Josephine M., born Dec. 18, 1866; Thomas A., born Nov. 21, 1867; Jesse E., born Sept. 2, 1868; and Francis A., born Sept. 8, 1871. Mr. Wilson enlisted in the Confederate States army on July 2, 1862, discharged Oct. 5, 1864. Since the war, and at the present, he has been engaged in the timber business and that of farming. Post office address: North Spring, West Va. Source: Dr. R.A. Brock, Virginia and Virginians, 1606-1888 (Richmond, VA: H.H. Hardesty, Publisher, 1888), p. 847. 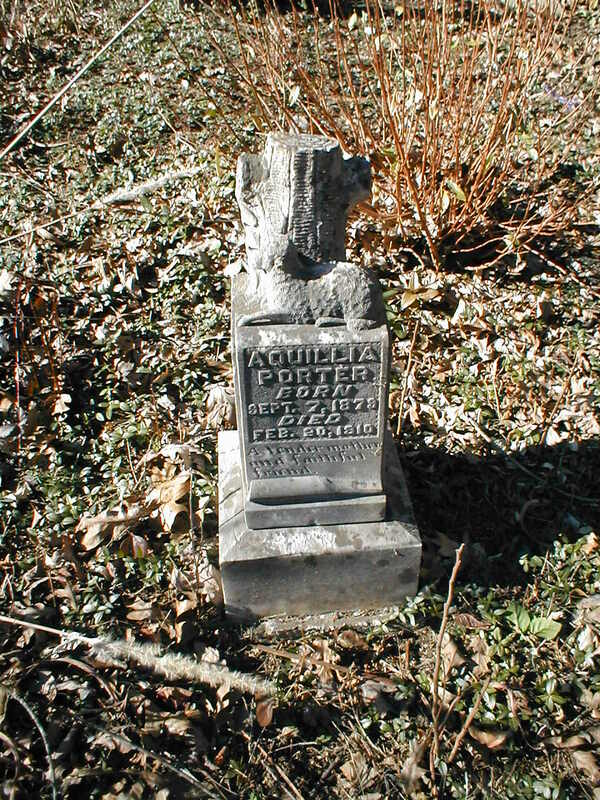 Aquillia Runyon Porter grave at the Williamson Family Cemetery in Milo, Martin County, KY. Aquillia, wife of Samuel W. Porter, was the daughter of John W. and Mary M. (Williamson) Runyon. 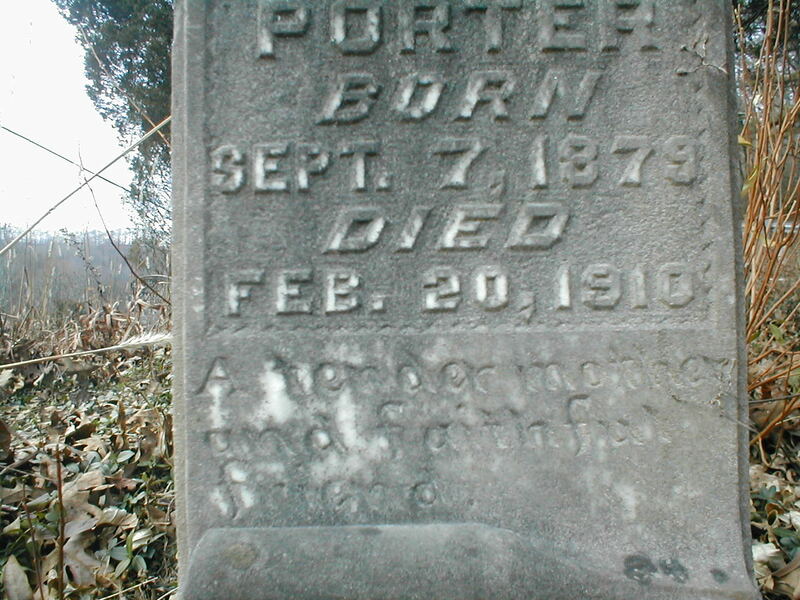 Aquillia Runyon Porter grave at the Williamson Cemetery in Milo, Martin County, KY. Aquillia, wife of Samuel W. Porter, was the daughter of John W. and Mary M. (Williamson) Runyon. The following list of Logan County marriages for the period of 1872 to 1876 reveals the names of preachers operating in the Harts Creek area. This is a “working list” and will be updated. The source for this material is “Marriages-Births-Deaths, 1872-1892,” pages 26-32, which is located at the Logan County Clerk’s Office in Logan, WV. Many thanks to the county clerks and their employees who have always been so helpful to my research these past twenty-five years. NOTE: Marriage records for the Lincoln County section of the community are unavailable.